Trying to decide between mesh banners or banners with wind slits for your work site fences? There are a variety of considerations that go into choosing the best option. But when installing your banners on fences, some simple math will quickly point you to the best answer. Let's start with simple definitions to makes sure we are on the same page. Wind Slits: A slit cut into the banner with the intent of giving the wind a way to blow through the banner and reduce the stress on the banner. It is typically cut in a half-moon or curved shape to create a flap that opens as wind creates pressure on the banner. Mesh Banner: A vinyl banner material with a weave that leaves a percentage of the area exposed for wind to pass through. 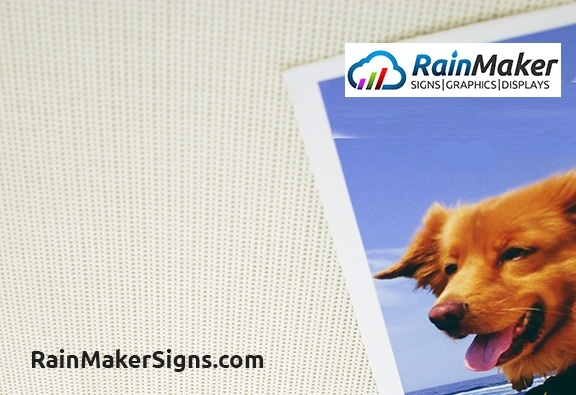 Like traditional vinyl banners, it can be printed with vibrant high resolution graphics. Anytime a banner is hung in an open area, spanning two structures, or installed on a fence there will be unavoidable stress on the banner from gentle airflow and large gusts of wind. The larger the surface area of the banner, the more pressure there is on the vinyl material, the material around the grommets, the fasteners, and the attachment to the fence or structure. A large gust of wind can easily blow over a fence or tear out an attachment if no actions are taken to improve air flow through the banner and reduce stress. More concerning than the cost of replacing a damaged banner or resetting a fence is safety and liability. Making the right choice of banner treatment for your project is not a trivial consideration. No calculator required. The weave in our mesh banners leaves 30% of the area open for wind to pass through. No matter the size of your banner, wind pass through is always 30% since this is inherent in the substrate. For Example: If your banner is 72" x 96" that is 6,912 square inches. 56 square inches for each wind slit. For our example, that's 448 square inches of wind slits / 6,912 square inches of banner area. The maximum wind stress reduction from these wind slits is about 6%. If you are depending upon a 6% wind reduction keeping your banner from blowing down you are more of a risk taker than we recommend.